Members of Congress are back home instead of trying to work out a plan to avoid massive across-the-board cuts scheduled to take effect March 1st. Many are using the opportunity to show how sequestration will hurt the people who live and work in their districts. U.S. House members Cheri Bustos and Adam Kinzinger talk about sequestration after a tour of SupplyCore in Rockford. Kinzinger blames the President and Democratic leadership for not taking up House-approved cuts late last year. Bustos blames Republican House Speaker John Boehner for NOT keeping them in Washington to work out a compromise before the March 1st deadline. The 113th Congress includes a freshman Democrat from northern Illinois and a second term Republican from a neighboring district who is taking on new territory. 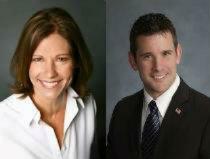 Cheri Bustos and Adam Kinzinger are busy preparing for what lies ahead in the next session.